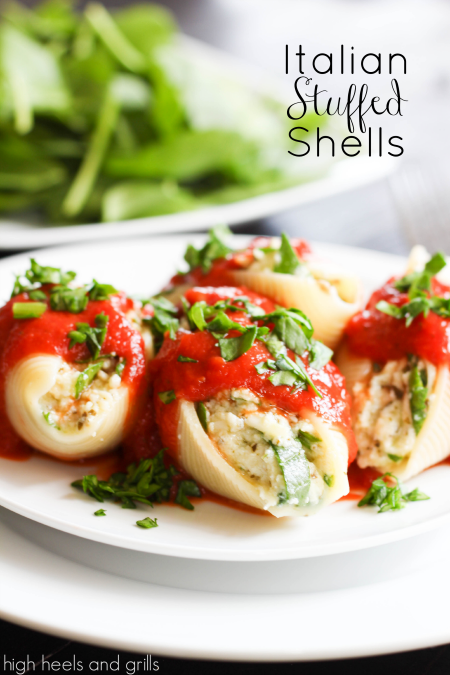 Have I ever told you how much we looooove stuffed shells? Because we do. We alternate between these beauties and a Mexican Stuffed Shells version and I can’t tell you how awesome they taste and how easy they are! Which pretty much means they’re the best dinner in the history of ever. You can’t go wrong with these babies! Cook pasta according to package directions until al dente. Drain pasta and run cold water over the shells to stop them from overcooking. Meanwhile, in a medium bowl, combine ricotta, pesto, cheese, egg, and spinach and mix well. Spread 1 cup of pasta sauce in the bottom of a 9×13 inch baking dish. Stuff the shells with 2-3 Tbsp. of ricotta mixture and place in the baking dish. Once all the shells are stuffed and the baking dish is full, pour the remaining 2 cups of pasta sauce over the shells and spread evenly. Bake for about 30 minutes or until pasta sauce bubbles up around the edges. I hope you enjoy these just as much as we do!